The Prayers: The Chaplet of Mercy is recited using ordinary rosary beads of five decades. The Chaplet is sometimes preceded by two opening prayers from the Diary of Saint Faustina and followed by a closing prayer. 1. Make the Sign of the Cross In the name of the Father, and of the Son, and of the Holy Spirit. Amen. 2. Optional Opening Prayers You expired, Jesus, but the source of life gushed forth for souls, and the ocean of mercy opened up for the whole world. O Fount of Life, unfathomable Divine Mercy, envelop the whole world and empty Yourself out upon us (Diary, 1319). O Blood and Water, which gushed forth from the Heart of Jesus as a fountain of Mercy for us, I trust in You! (three times) (84). 3. Our Father Our Father, Who art in heaven, hallowed be Thy name; Thy kingdom come; Thy will be done on earth as it is in heaven. Give us this day our daily bread; and forgive us our trespasses as we forgive those who trespass against us; and lead us not into temptation, but deliver us from evil, Amen. 4. Hail Mary Hail Mary, full of grace. The Lord is with thee. Blessed art thou amongst women, and blessed is the fruit of thy womb, Jesus. Holy Mary, Mother of God, pray for us sinners, now and at the hour of our death, Amen. 5. The Apostle’s Creed I believe in God, the Father Almighty, creator of heaven and earth. I believe in Jesus Christ, His only Son, our Lord. He was conceived by the power of the Holy Spirit, and born of the Virgin Mary. He suffered under Pontius Pilate, was crucified, died, and was buried. He descended to the dead. On the third day He rose again. He ascended into heaven, and is seated at the right hand of the Father. He will come again to judge the living and the dead. I believe in the Holy Spirit, the holy catholic Church, the communion of saints, the forgiveness of sins, the resurrection of the body, and the life everlasting. Amen. 6. The Eternal Father Eternal Father, I offer you the Body and Blood, Soul and Divinity of Your Dearly Beloved Son, Our Lord, Jesus Christ, in atonement for our sins and those of the whole world. 7. On the Ten Small Beads of Each Decade For the sake of His sorrowful Passion, have mercy on us and on the whole world. 8. 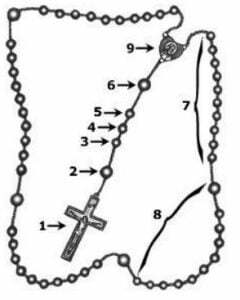 Repeat for the remaining decades Saying the “Eternal Father…” (6) on the “Our Father” bead and then 10 “For the sake of His sorrowful Passion…” (7) on the following “Hail Mary” beads. 9. Conclude with Holy God (Repeat three times) Holy God, Holy Mighty One, Holy Immortal One, have mercy on us and on the whole world. 10. Optional Closing Prayer Eternal God, in whom mercy is endless and the treasury of compassion — inexhaustible, look kindly upon us and increase Your mercy in us, that in difficult moments we might not despair nor become despondent, but with great confidence submit ourselves to Your holy will, which is Love and Mercy itself.